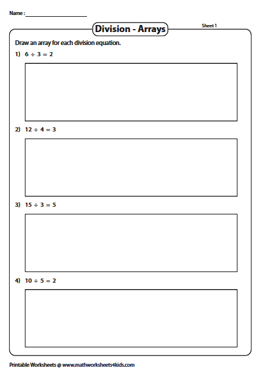 Featured here is a compilation of division array worksheets designed to familiarize kids of grade 3 with the concept of division. 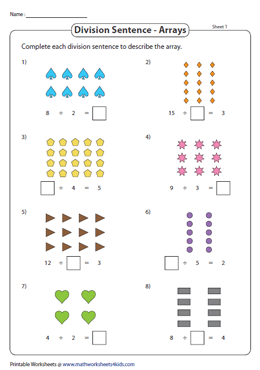 Included here is an array chart and skills like interpreting the division array and answering questions based on it, completing the division sentences, deciphering the array to write a division sentence, solving word problems and drawing arrays to mention a few. The division array chart clearly illustrates an array along with the two ways of writing the division equation. Each part of the equation is precisely defined and helps introduce the concept of division with ease. Observe each array keenly and answer the questions based on your comprehension. 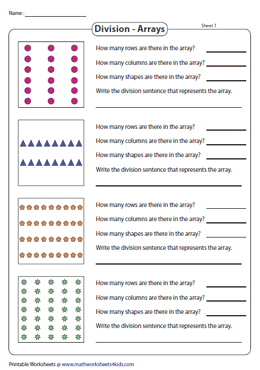 Also, write the division sentence that describes the array in this set of division array worksheets. 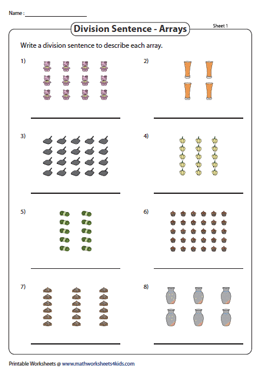 Figure out the division sentences to describe the arrays presented in this batch of worksheets. Direct kids of grade 3 to count the objects, rows and columns and set up a division equation accordingly. Examine the arrays and plug in the missing part in these division sentences. The number of objects is the dividend, if the number of rows is the divisor, then the quotient is the number of columns or vice versa. 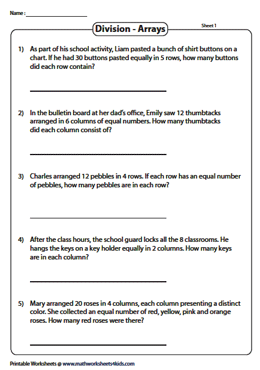 Apply the concept of array division to real-life scenarios offered in this stack of division array worksheets. 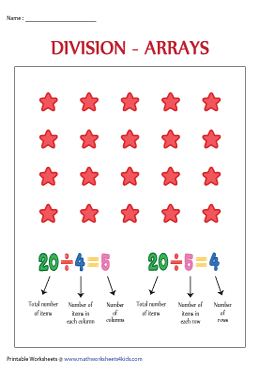 Read the problems carefully, represent them as arrays and enhance division skills in the process. Review conceptual knowledge with this unit of worksheets. Comprehend the division statements and interpret them as arrays by drawing objects or shapes in the correct number of rows and columns.